The Grand Rapids Griffins have added another Michigan native to their roster. The Red Wings’ AHL affiliate announced the signing of Grosse Pointe native Kevin Lynch today, adding their second University of Michigan product in as many summers (Luke Glendening). Lynch, a Columbus Blue Jackets second-round pick in 2009, spent four seasons skating for Red Berenson in Ann Arbor, playing in 168 collegiate games. 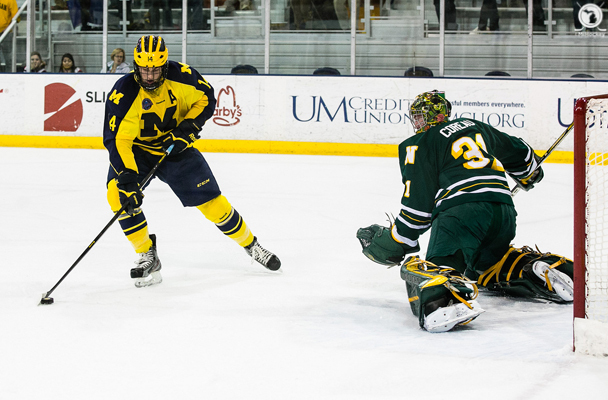 During his time with Michigan, Lynch recorded 35 goals and 37 assists, along with 158 penalty minutes. The 6-foot-1, 198-pound forward played for the National Team Development Program in Ann Arbor for two seasons before joining the Wolverines. Lynch helped Team USA win a gold medal at the 2009 IIHF World Under-18 Championship. ← Caples: Hey hockey people – are you helping or hurting our sport?